When the package of this book promptly arrived in the mail, I told my 6-year-old son it was for him. He eagerly tore open the slim box and pulled out the attractive hard covered book. He was excited to find it also came with a read-along and sing-along CD! I handed the book to my 9-year-old daughter and told her to read it to her brother. She said the story was cute. The Book About Tony Chestnut is about a shy boy named Tony Chestnut and his sister Eileen who have just moved to a new home and a new school. Tony tries to comfort his sister who is very sad about leaving her old friends. He finally comes up with an inventive way to do so. My son simply loves listening to the book by following along with the CD. He loves the song and sings it by heart when playing or jumping on the couch (he is quite the acrobat!) and my daughter will chime in too. It’s a catchy tune. The illustrations are adorable. In the middle of the book there are 4 pages that are progressively shorter than the rest, almost like flaps, which we thought were cool. I enjoy watching my daughter read the book to her brother and then hear them as they get to the singing part and begin singing together. It reflects the theme of brotherly and sisterly affection conveyed so beautifully in this touching story about a boy who overcomes his shyness to comfort his sister. This book is ideal for pre-schoolers, children going to school for the first time or young kids who have recently moved and want to make new friends. Would you like a chance to win this book? Author Laurie Monopoli from The Learning Station has graciously offered a copy to give away! But first, you might want to learn a little more about this book. 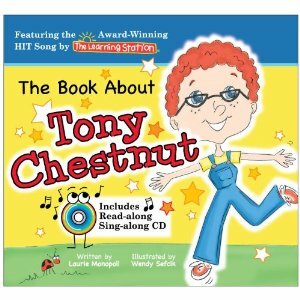 Monopoli told me that The Book About Tony Chestnut is based upon the song, "Tony Chestnut" that The Learning Station wrote and released in 1997. With the introduction of the internet they quickly realized that their little kids tune had made its way around the world and had become an international sensation being enjoyed by ALL ages. Knowing that, it seemed only fitting to bring the characters in the song to life. And that's how the book project was born! Check out this video of children singing the Tony Chestnut song. What's more, The Learning Station is filled with music, activities and handouts to help young kids. Here is a printable ‘Tony Chestnut’ activity sheet. This is a great way for your child to share the movements to the Tony Chestnut song with family and friends; along with supporting his early reading skills. 6. Giveaway ends July 20, 2010. Disclosure: Thanks to The Learning Station for sending this book for review. I was not compensated in any other way, nor told how to rate or review this product. Please count me in! I am a new follower. I would love to win this book for my little nephew!! I am a follower! My kids would love this book!! I'm a follower and I think my kids would love this!